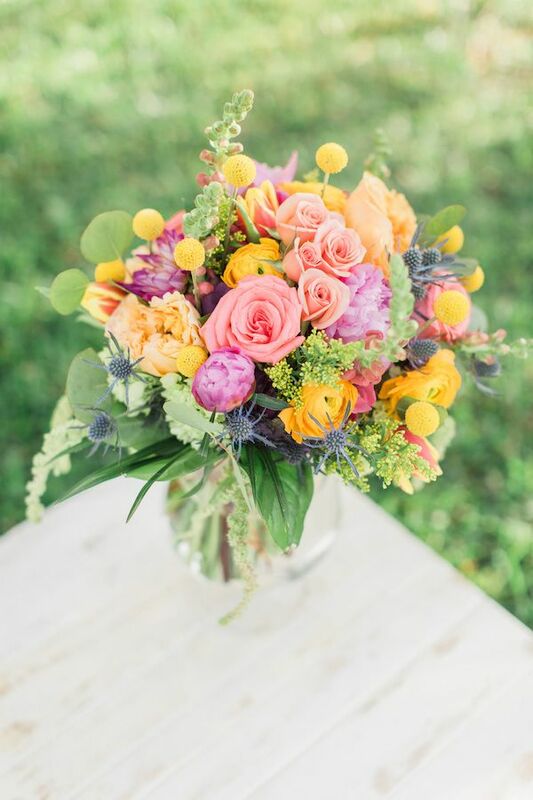 Well, hello there, color-lovers! 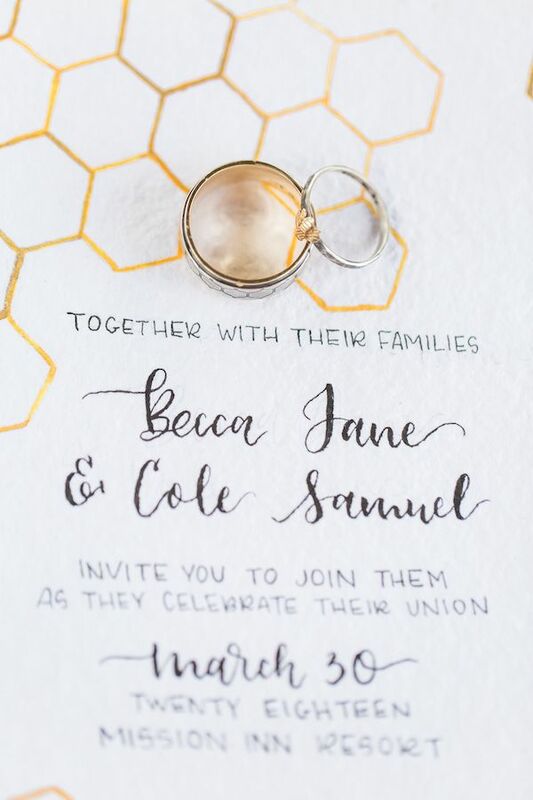 Time to get excited for all that's to come! 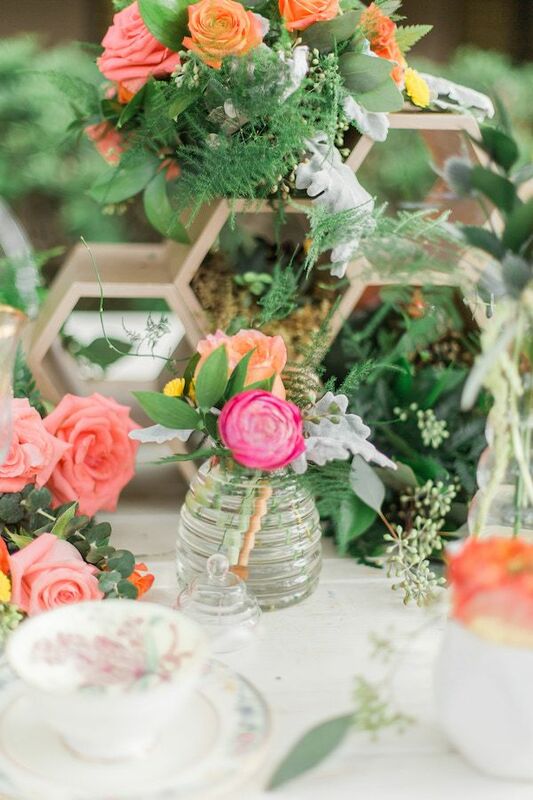 Because today we've got a shoot that will surely keep people buzzing for days. 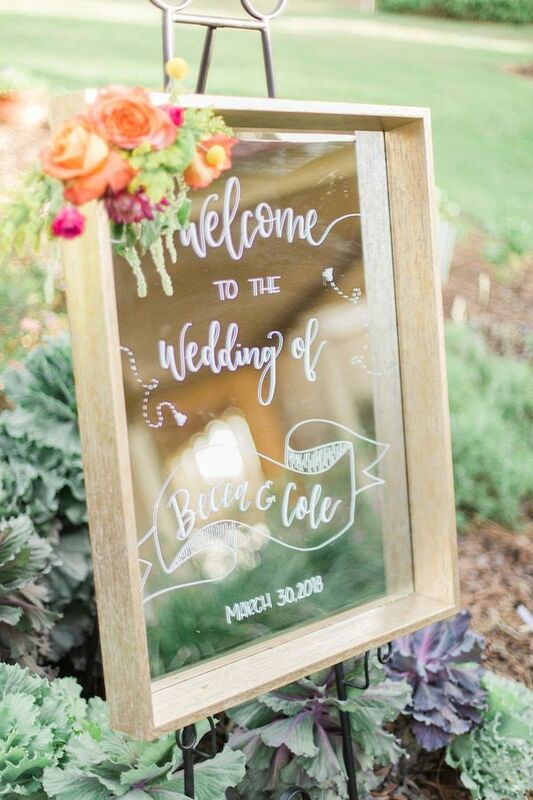 And by people, we mean you! 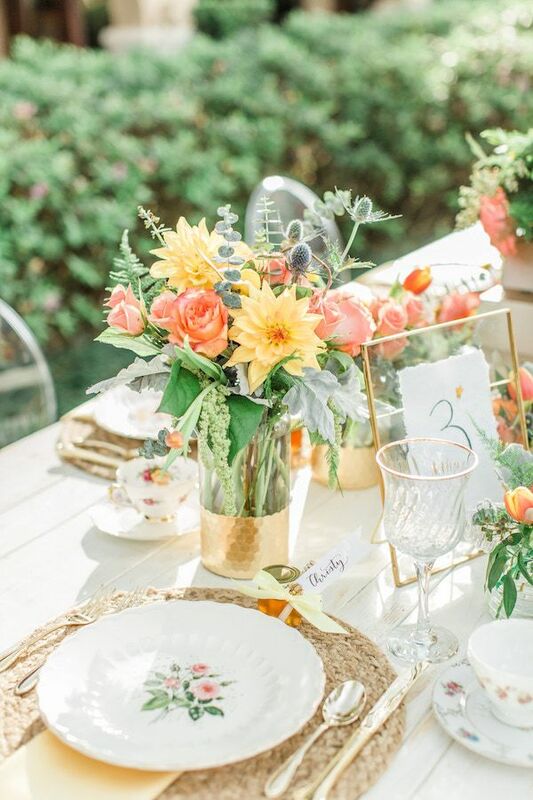 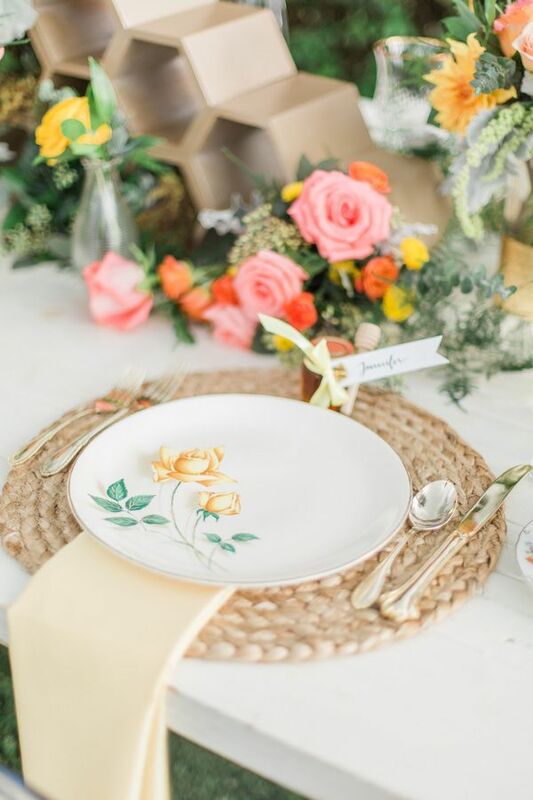 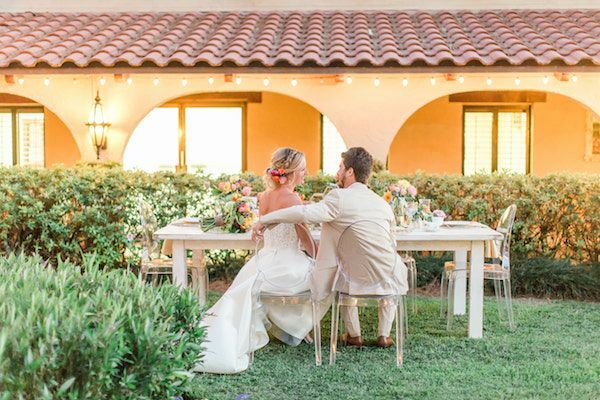 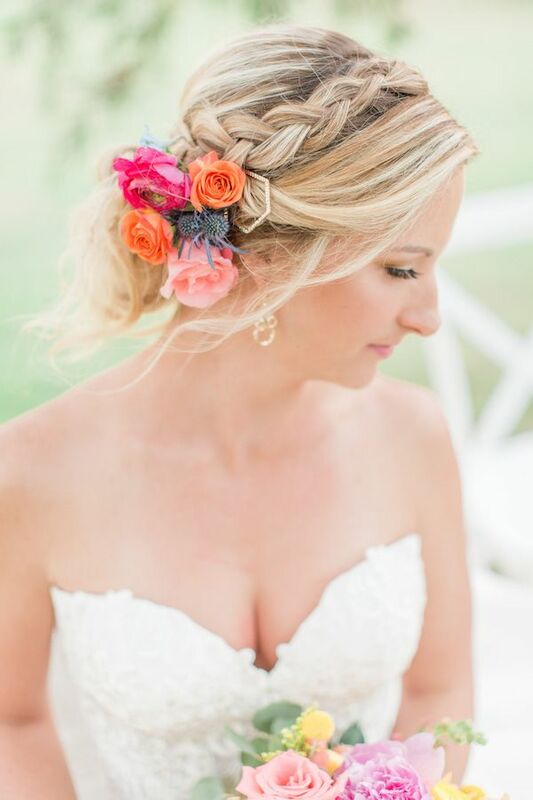 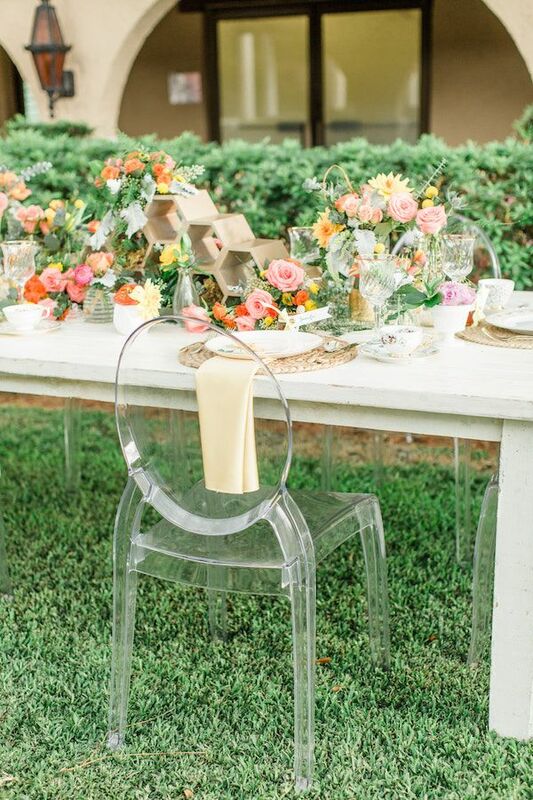 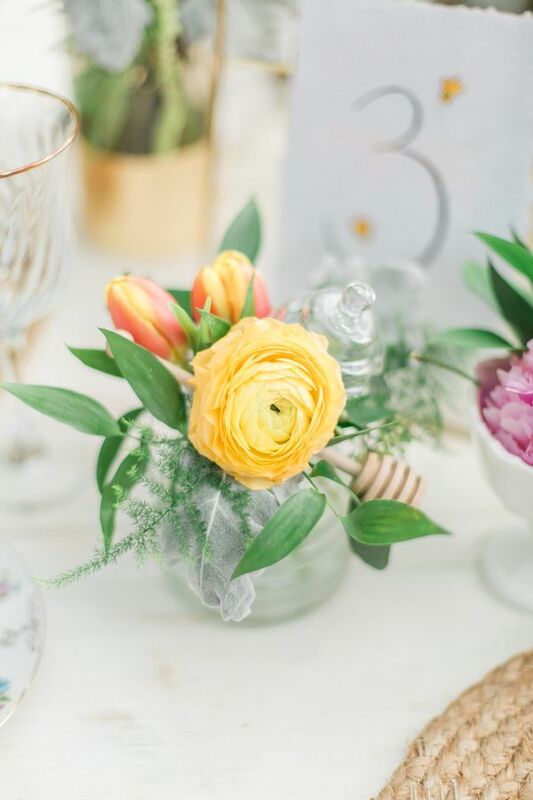 From the intricate attention to detail to the perfect pops of color throughout — everything about this shoot screams spring! 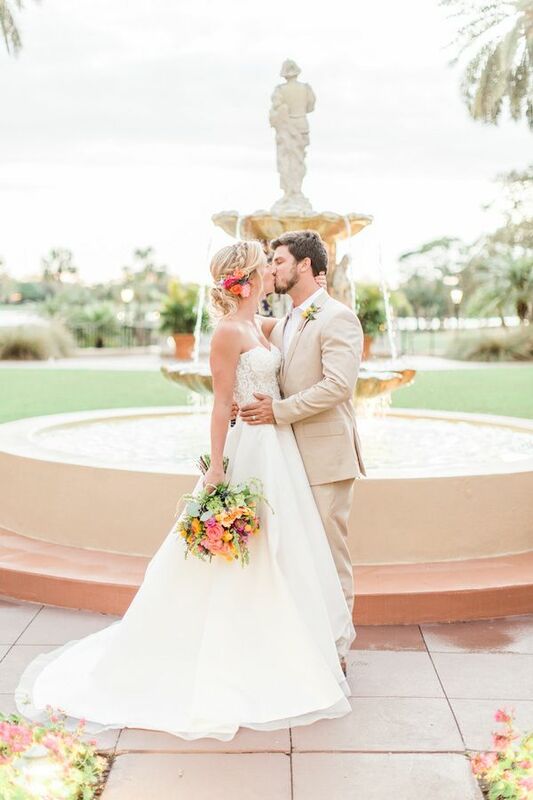 And lucky for us The Hendricks were there to capture it all! 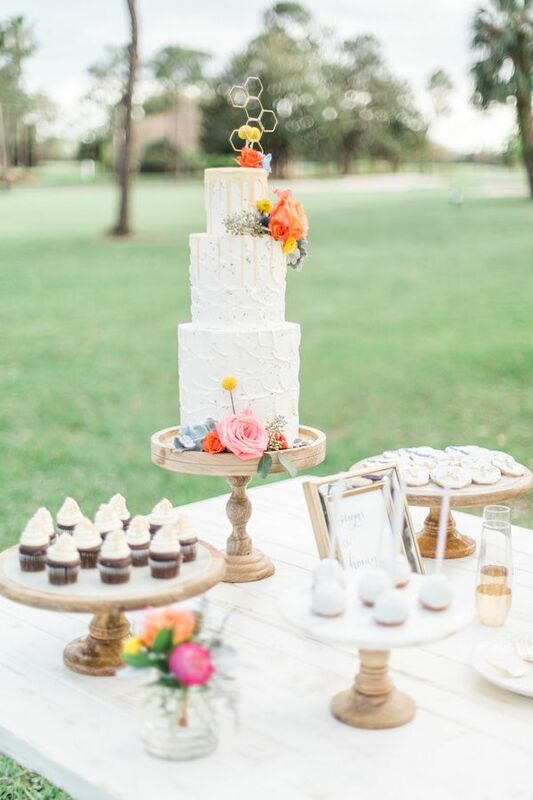 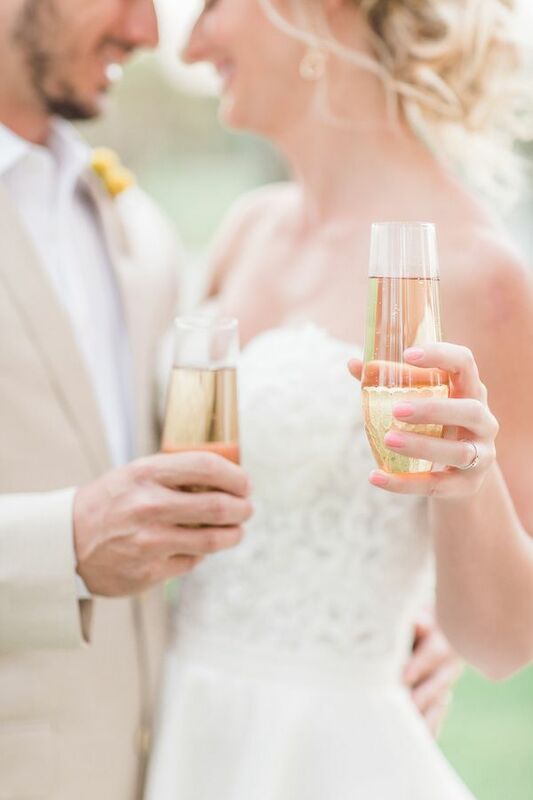 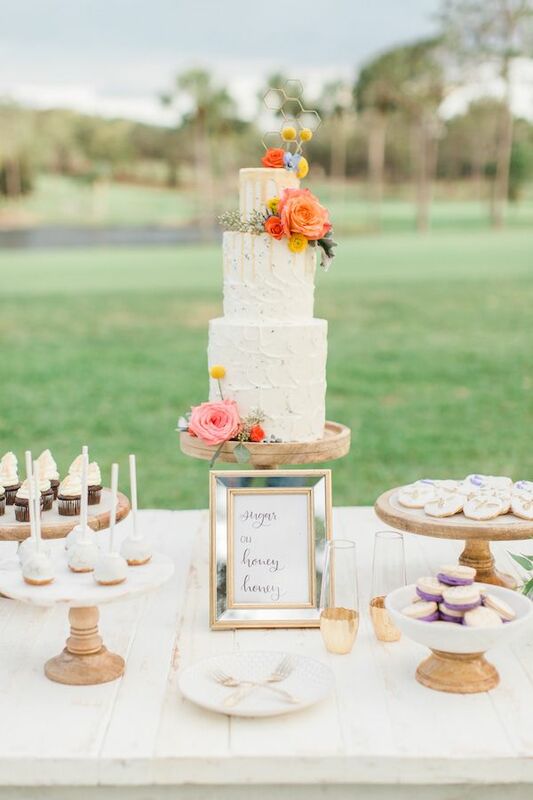 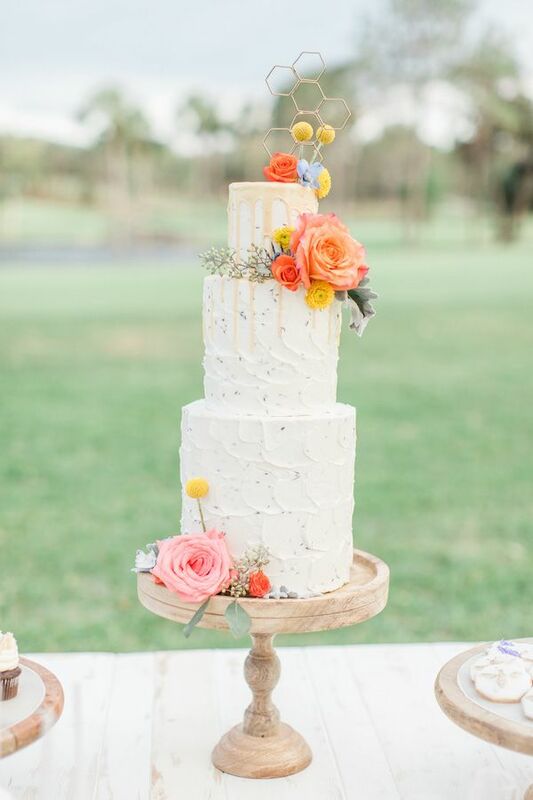 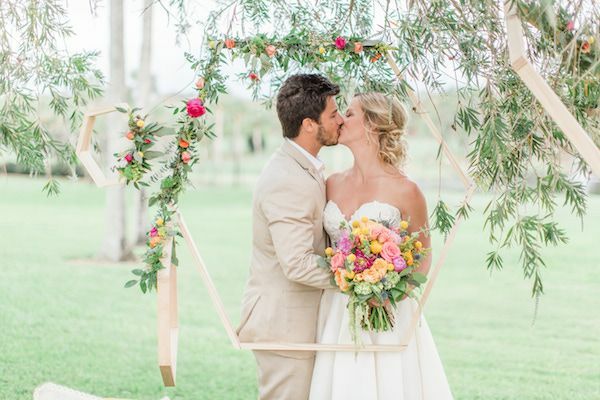 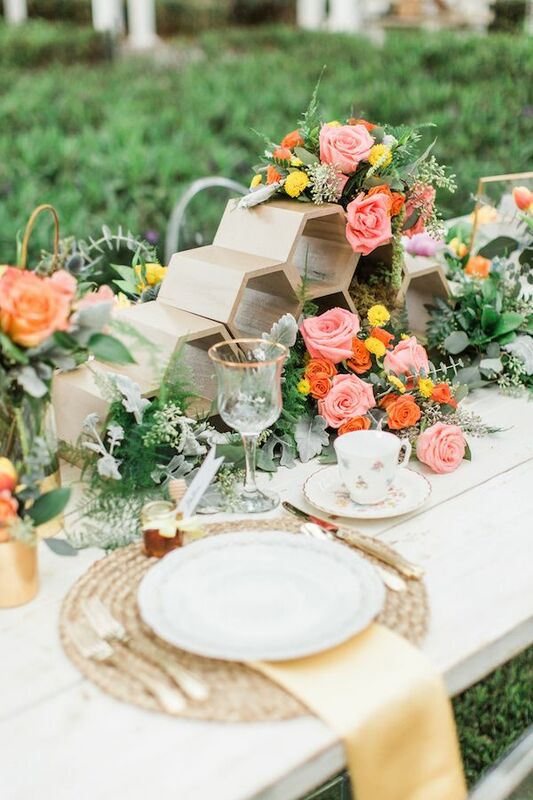 The mastermind behind this buzz-worthy shoot was Katie Jimenez with Big Day Celebrations! 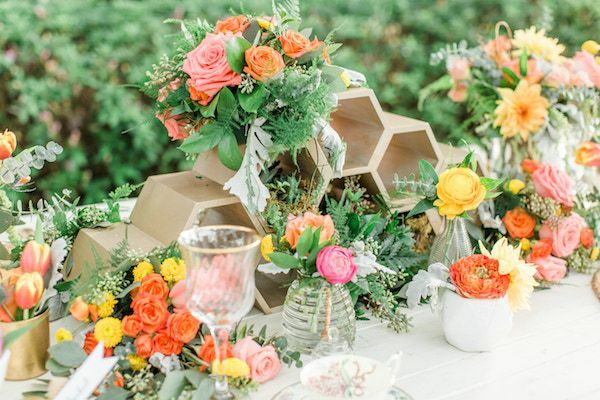 Here's what she had to say about how it all came together, "We started with a concept that originally stemmed from gardening (pun totally intended), specifically the idea of planting flowers to attract butterflies. 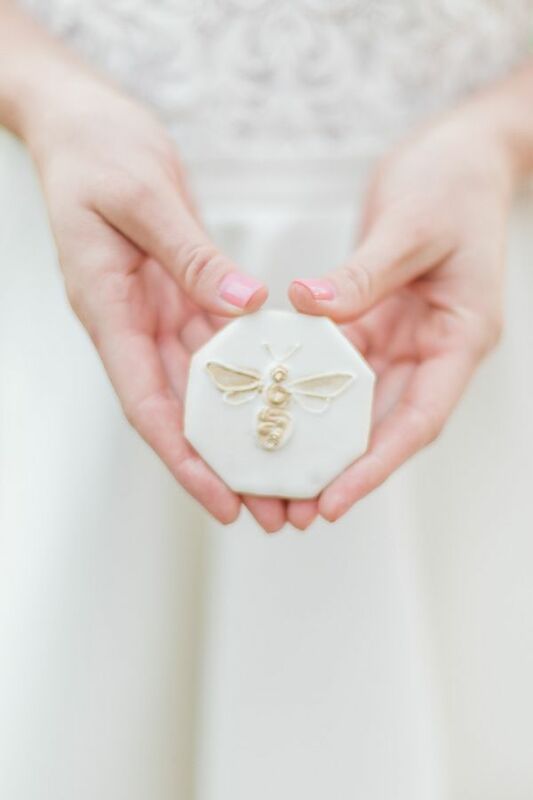 But then as time went by, it was all about the bees! 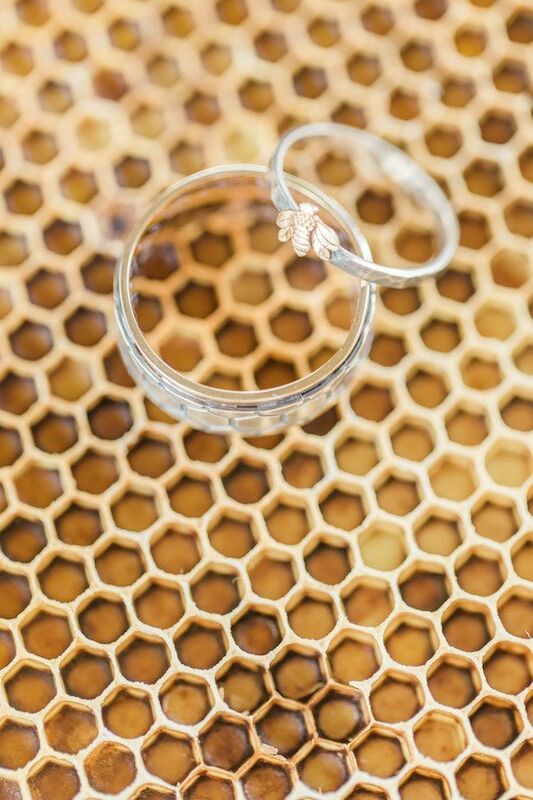 Bee keeping to be specific." 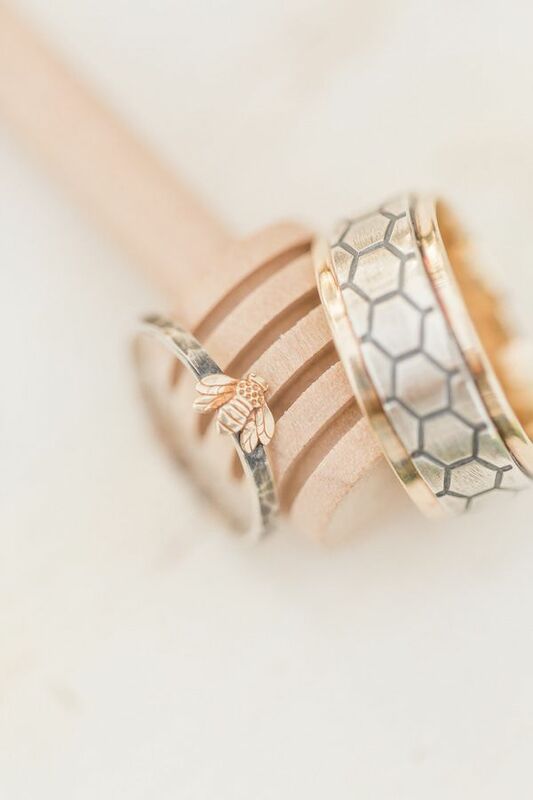 "More specifically, it was inspired by my mom who began with one little hive in the back yard and now has three larger ones! 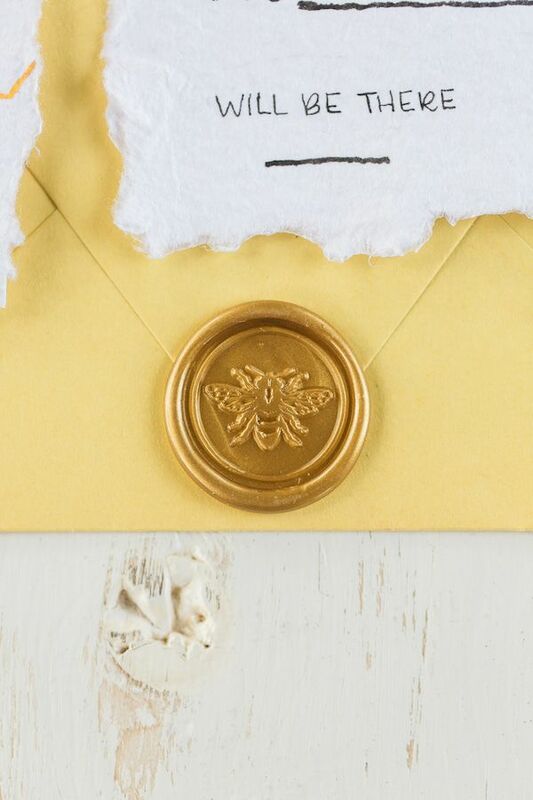 And do you know what that means? 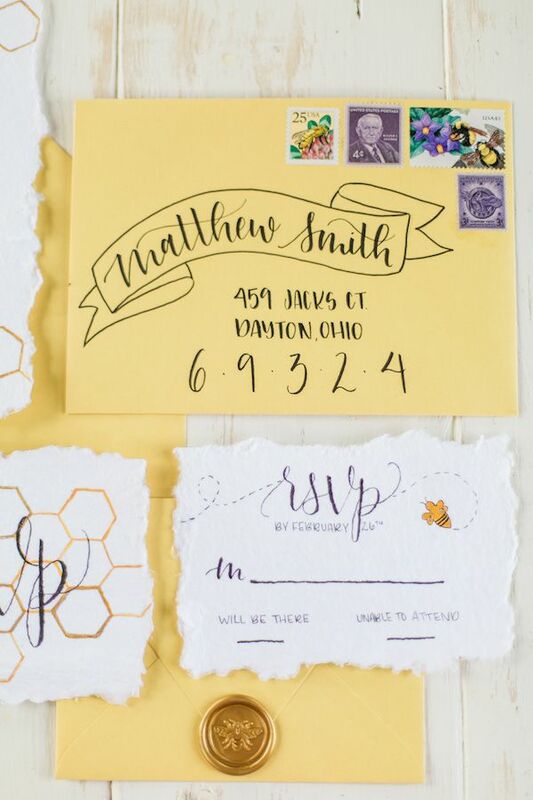 Tens of thousands of bees...all over the yard." 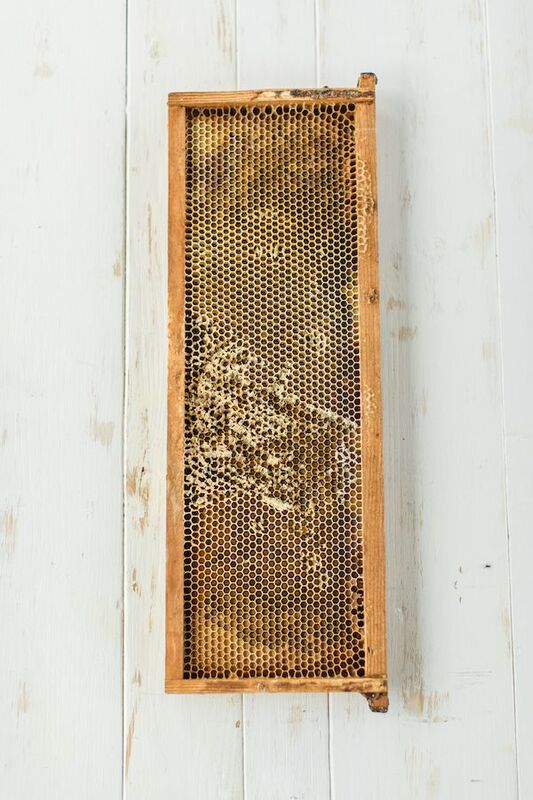 "I always get a big smile and a little laugh watching her in her bee suit, with her smoker checking the hives and talking to her "girls" as if they understand her. 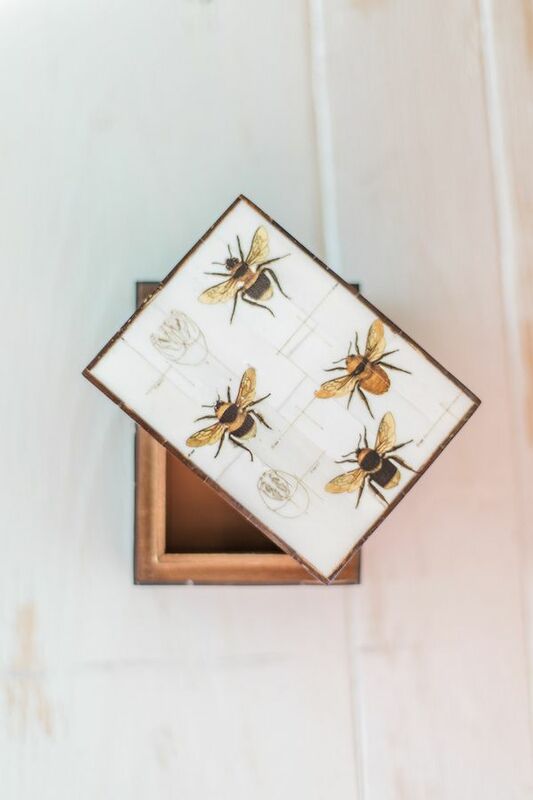 She absolutely loves this new hobby of hers and even became the treasurer of the local bee club." 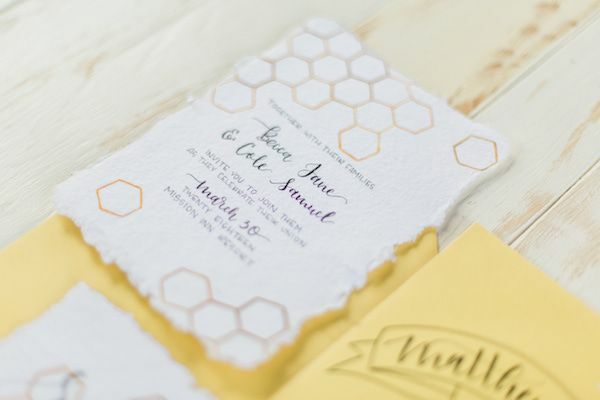 "I wanted to take her passion for bees and gardening and turn it into an inspiration shoot, fit for a queen (bee that is). 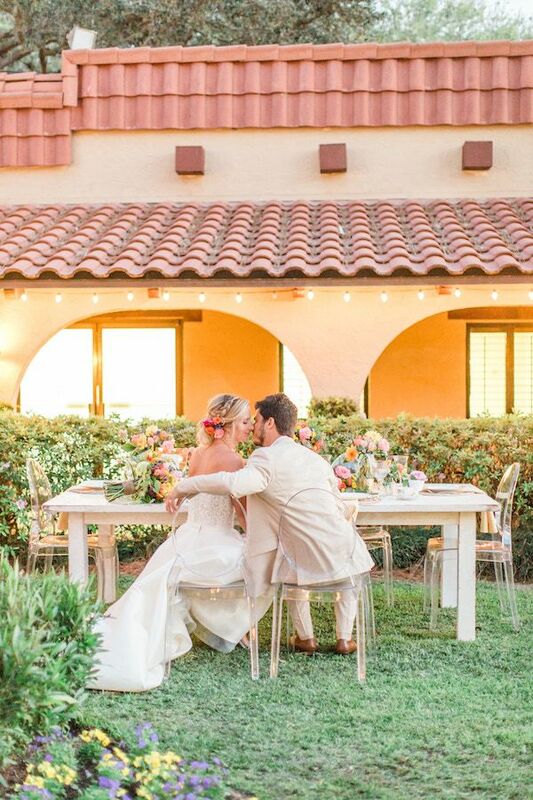 First I had to find the perfect venue." 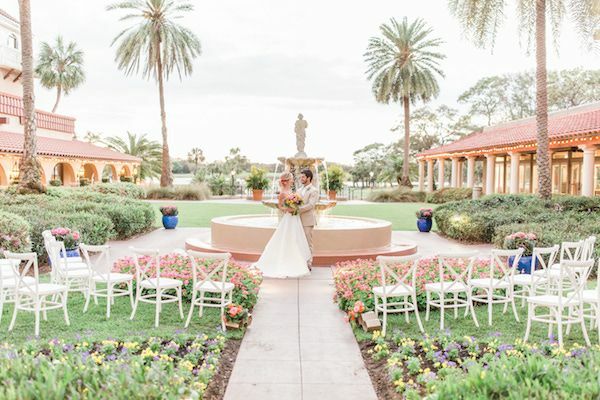 "I immediately thought of Mission Inn Resort's, Plaza de la Fontana because of it's beautiful garden-like feel, green grass and fountain." 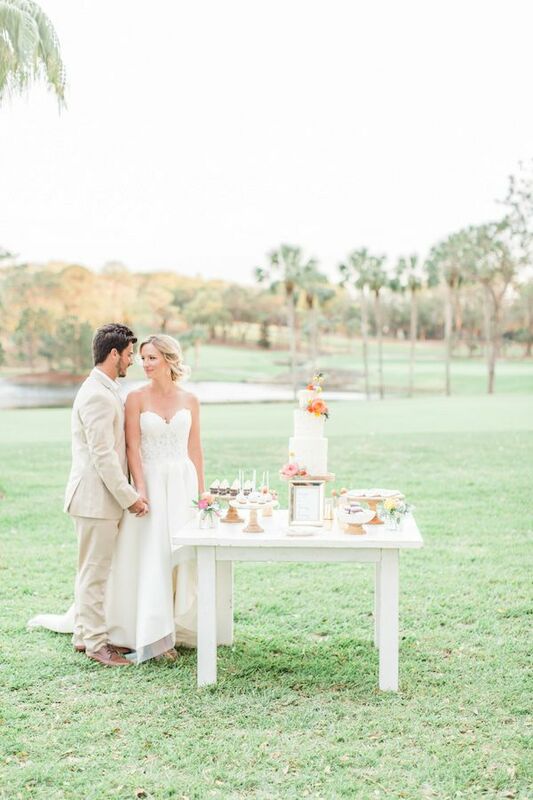 "It was the perfect spot for an outdoor shoot! 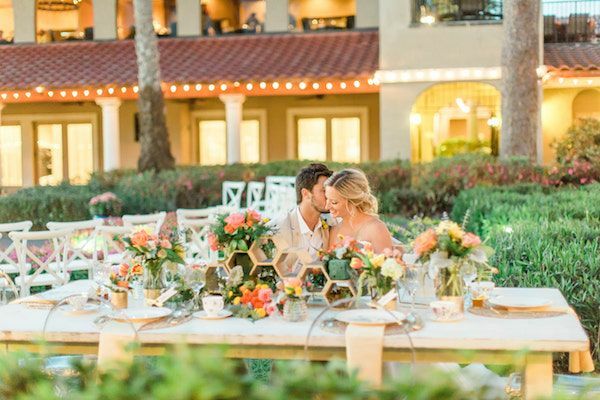 After the venue was locked in, it was time to pull together a rockstar team of vendors to make the ideas I had in my head come to life." 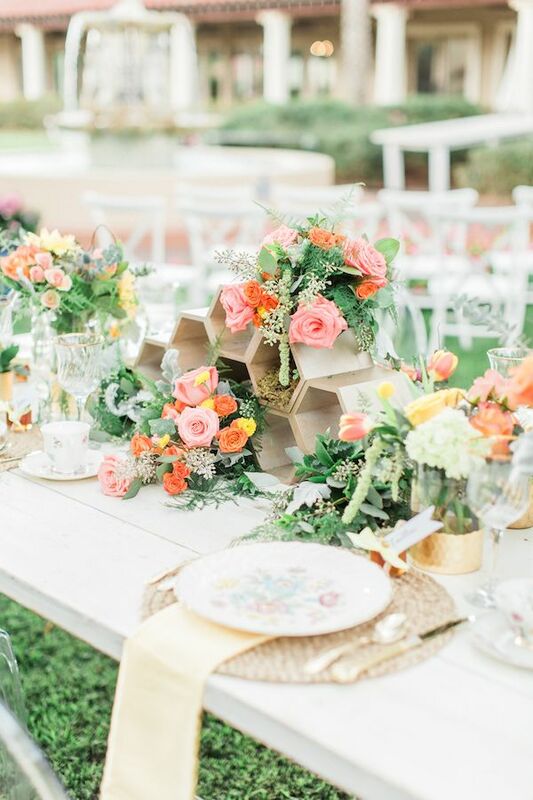 "Because we were going for a garden vibe, I knew floral was going to be one of the most important things. 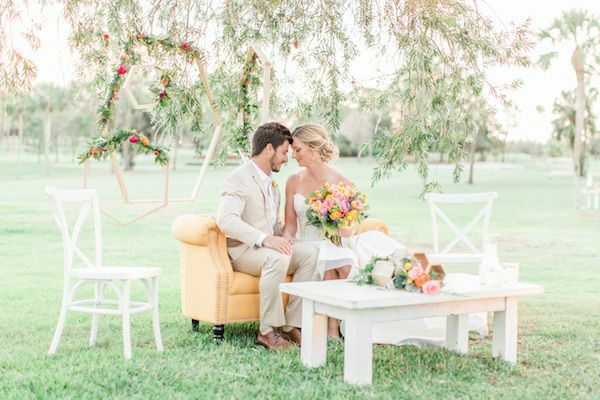 In Bloom Florist is one of Orlando's top florists and I knew they would be a perfect fit. 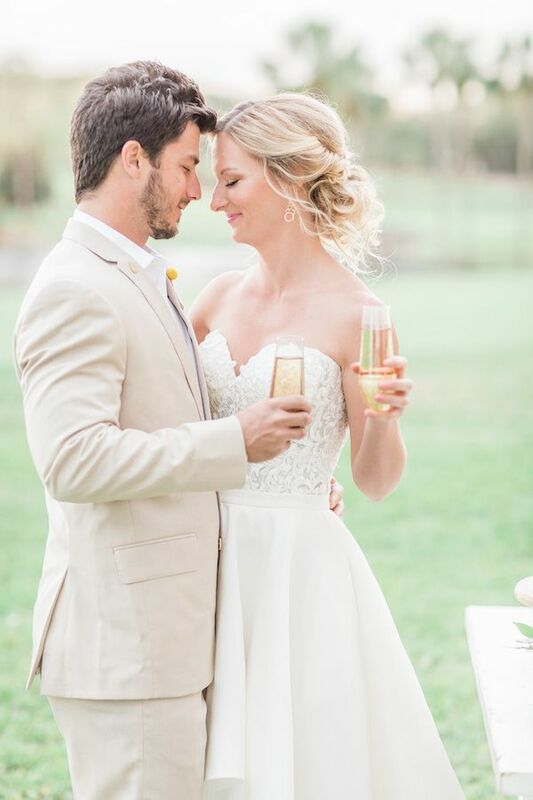 I was so happy when they said "yes!" 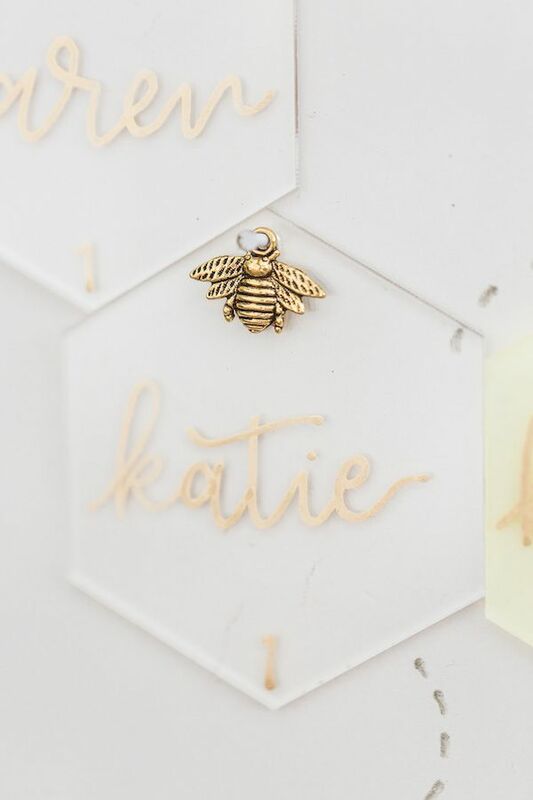 I went into my meeting with Rochelle with all kinds of bee decor." 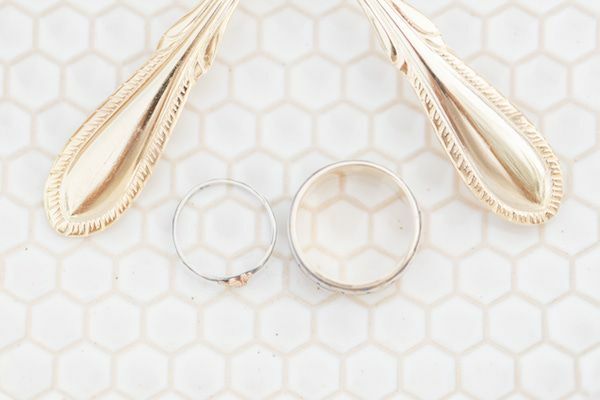 "Some I had purchased and some my mom had given to me. 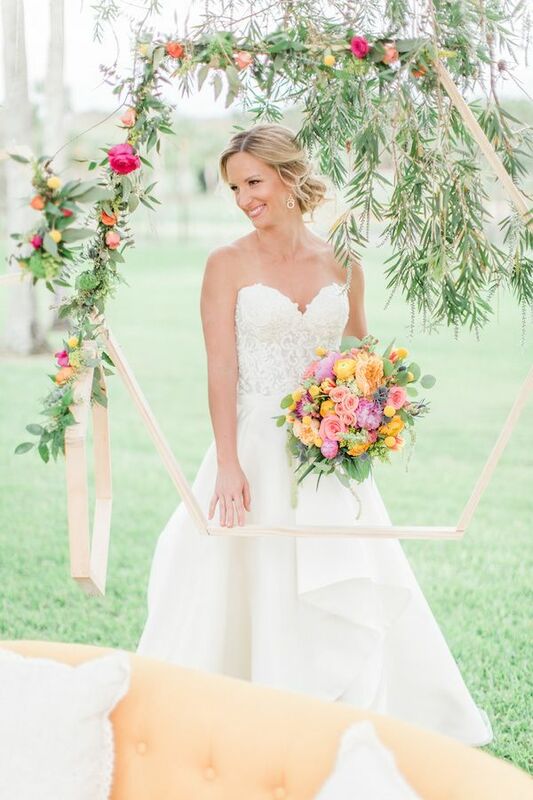 After a great brainstorming session, I walked out on cloud nine because I knew it was going to be beautiful! 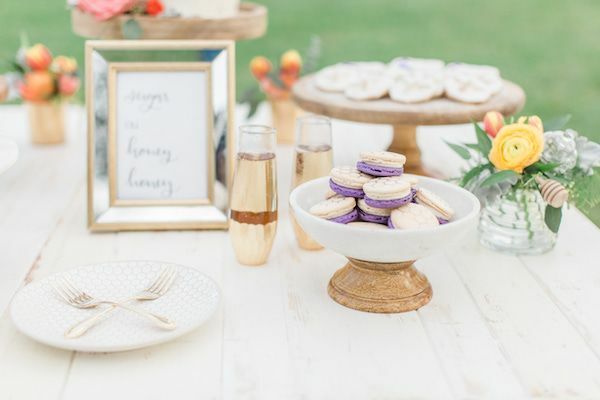 We decided on bright colors including: pinks, yellows and oranges with pops of purples and blues." 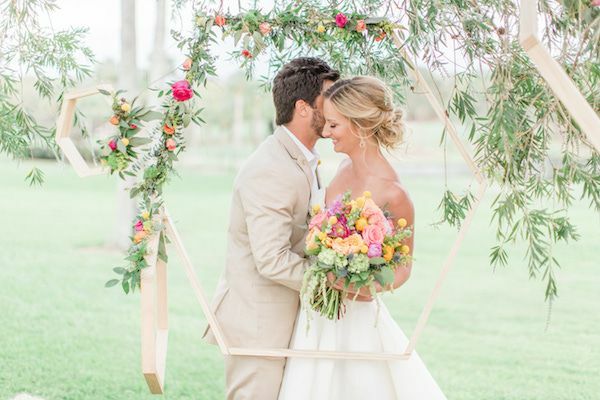 "Everything came together and meshed so well together. 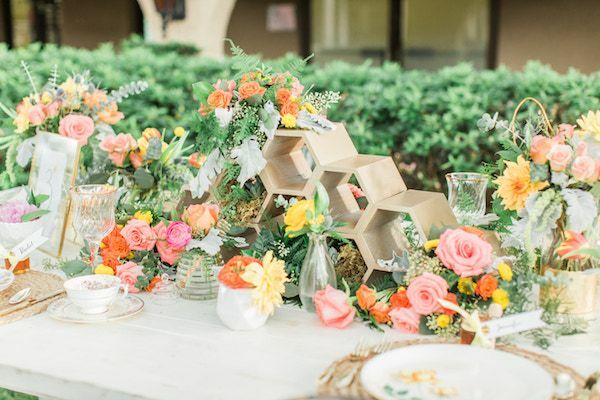 It was the perfect color palette for a spring/summer shoot for sure." 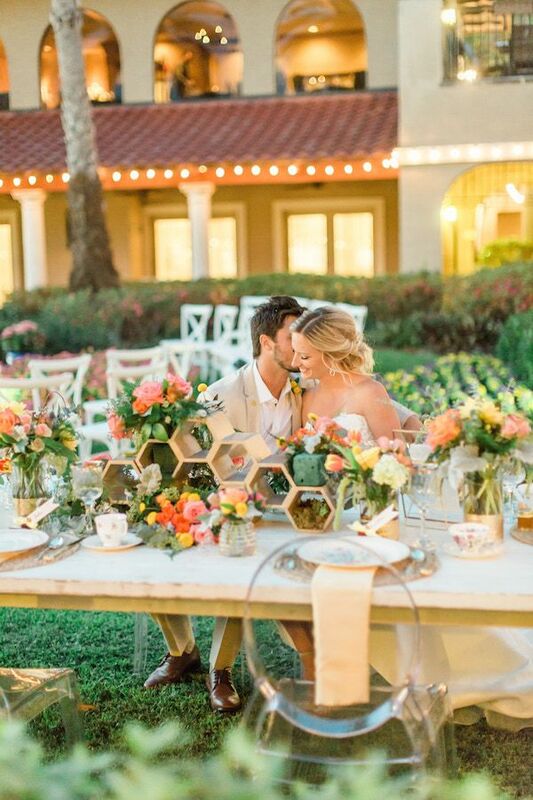 "I found these awesome hexagon wine racks on Amazon. 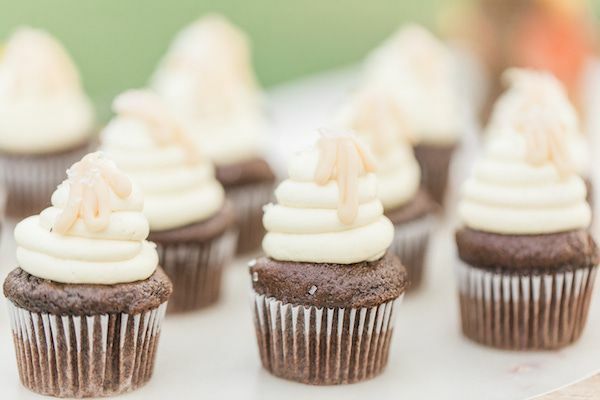 They were very versatile and you could stack them on top of each other. 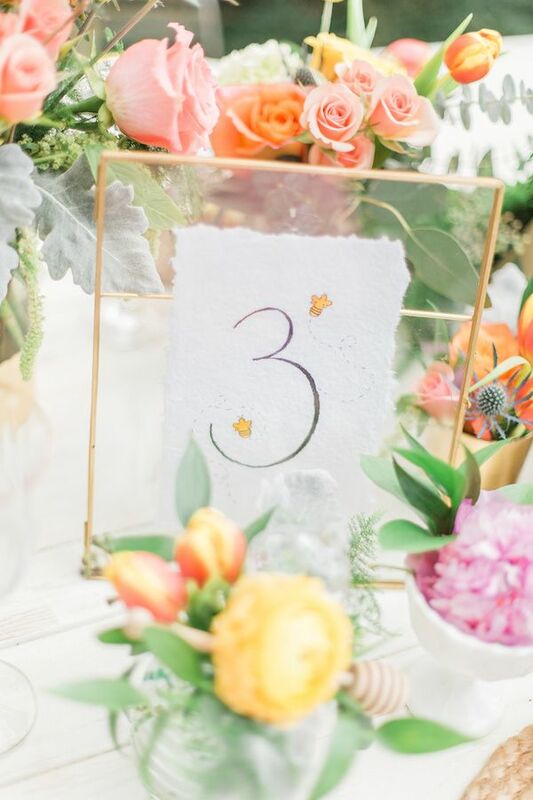 I decided to paint them gold and we would use them as part of the centerpiece for the reception table." 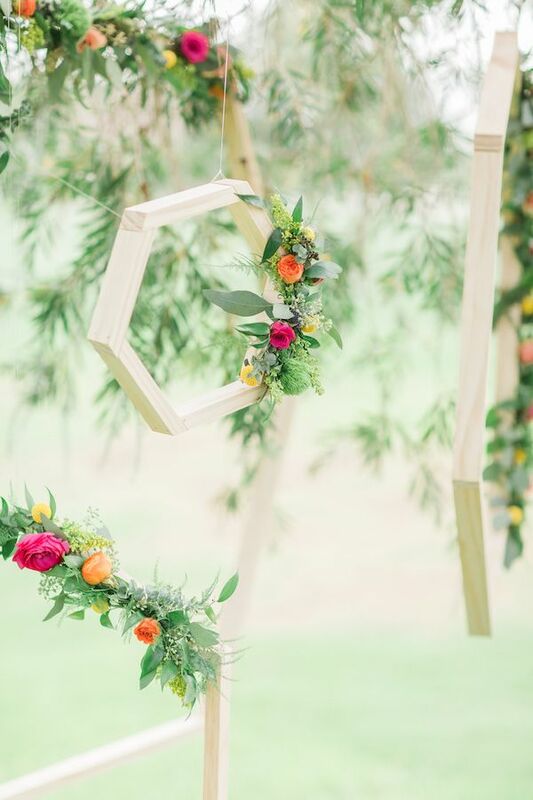 "In Bloom knocked it out of the park and transformed such a simple wine rack into a stunning centerpiece. 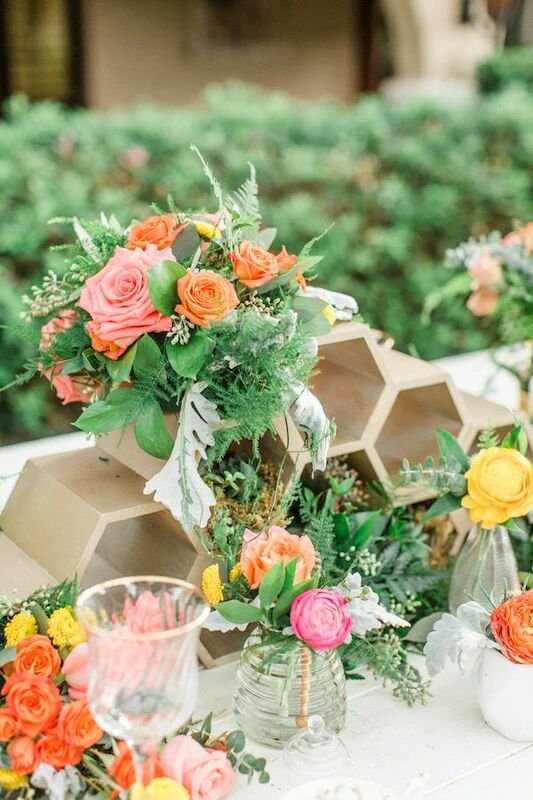 They had flowers cascading out of the racks and gathered together on top. 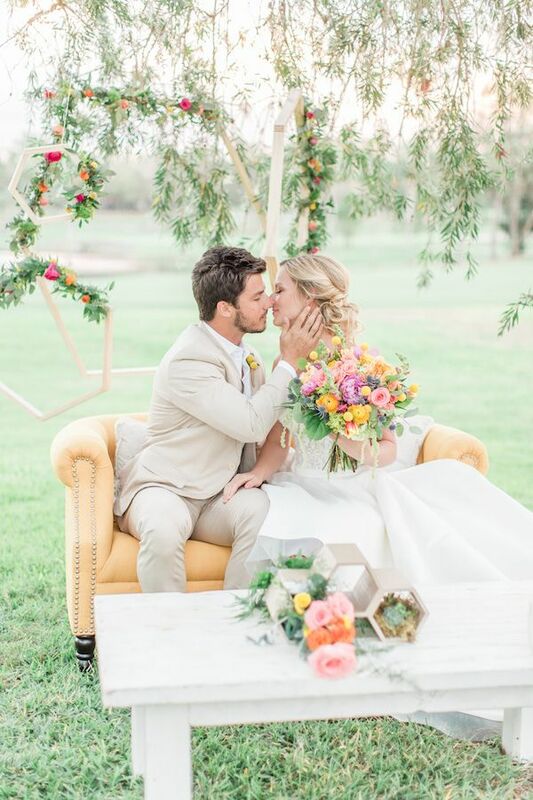 It was beautiful!" 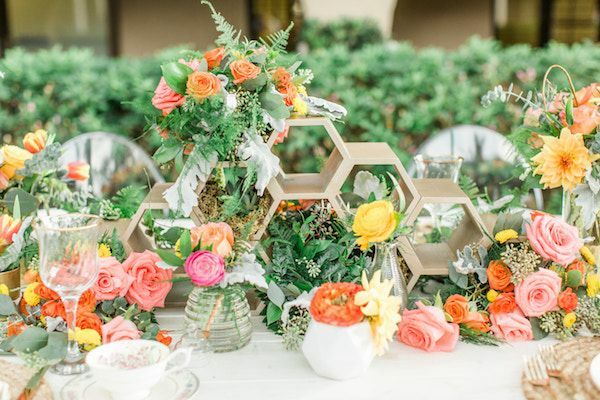 "We paired the wine racks with a mixture of milk glass, gold vases and of course, my mom's glass beehive jars. 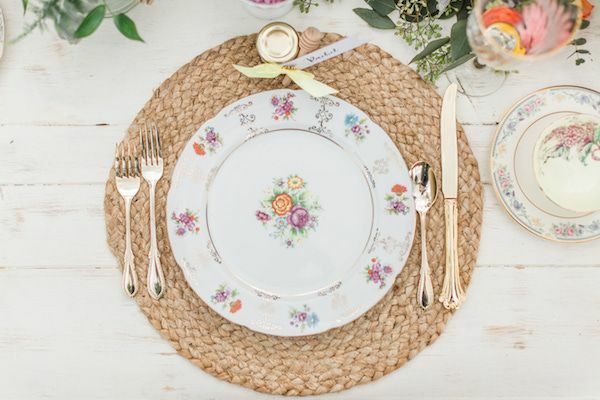 To complete the look, we incorporated a white farm table and ghost chairs from A Chair Affair and beautiful tableware from The Vintage Dish - Timely Tableware." 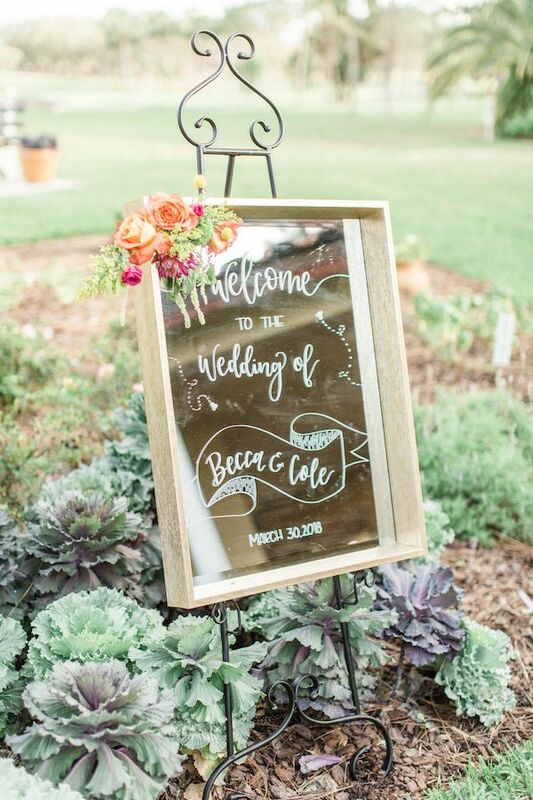 "The invitation suite was also created by Two Peas Designs as was the welcome sign and seating chart. 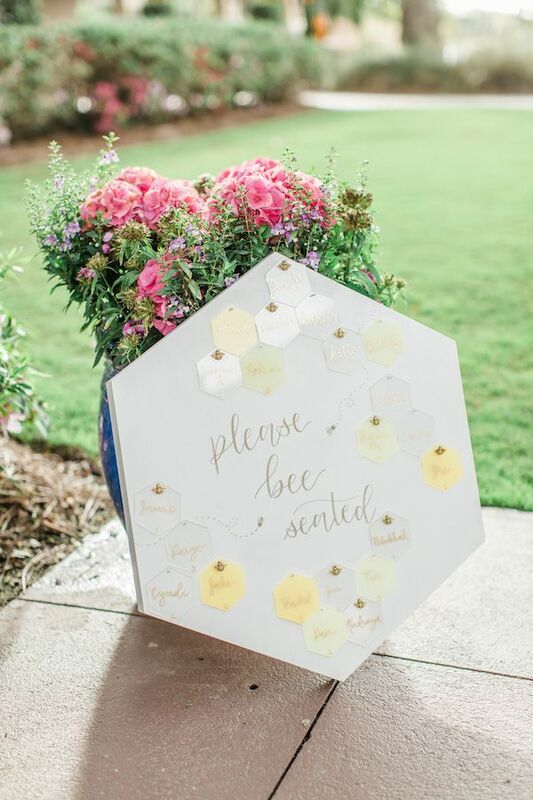 She did such an amazing job bringing all of the bee details to life and I will say that invitation suite, with it's hand ripped, hand-made paper and perfectly written script was one of my favorites of all times!" 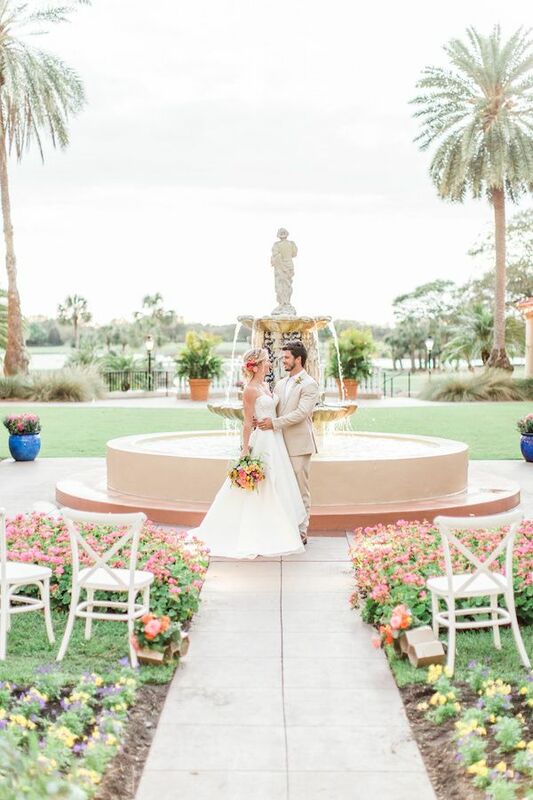 "For the ceremony, we kept it simple because the plaza was so pretty on its own already! 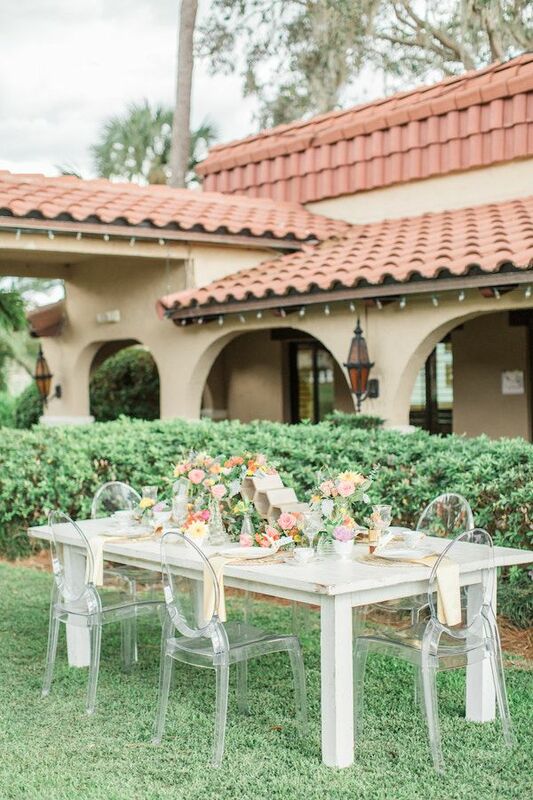 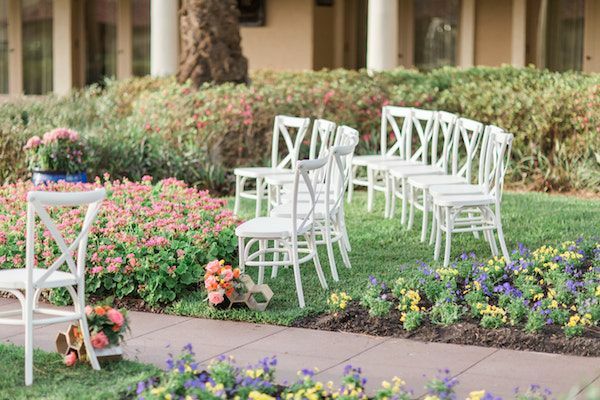 A simple set up of white French country chairs facing the beautiful fountain and that was it!" 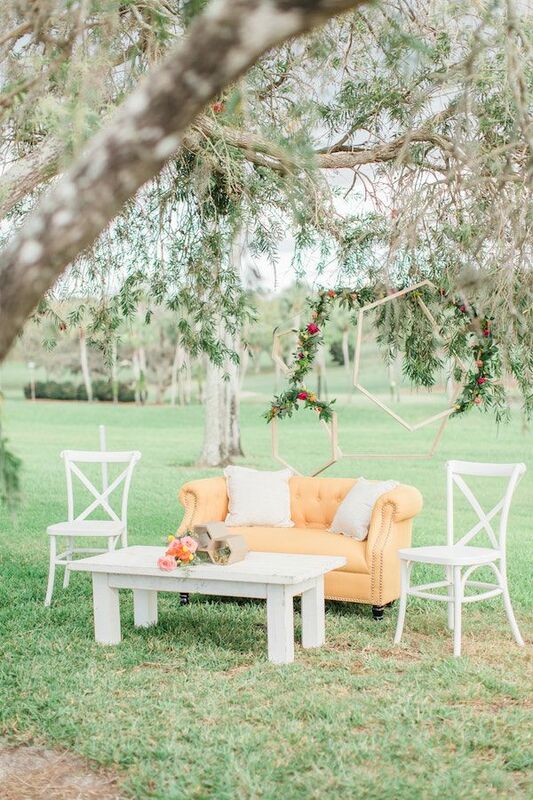 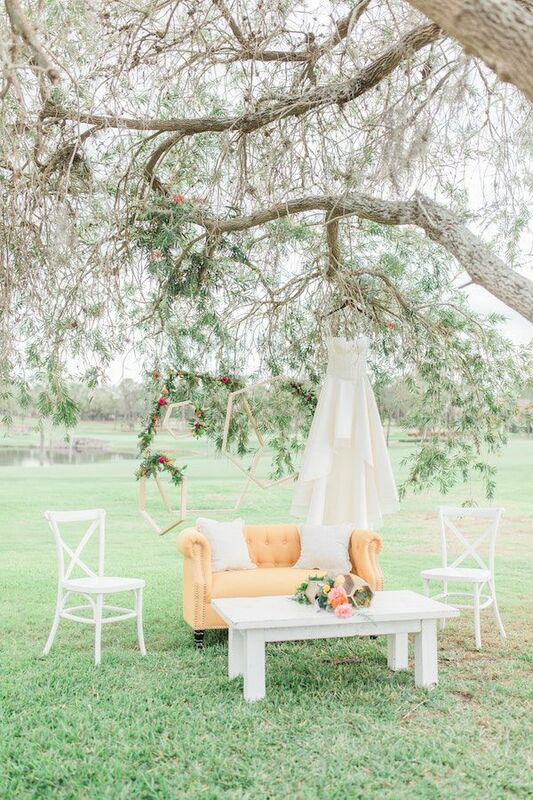 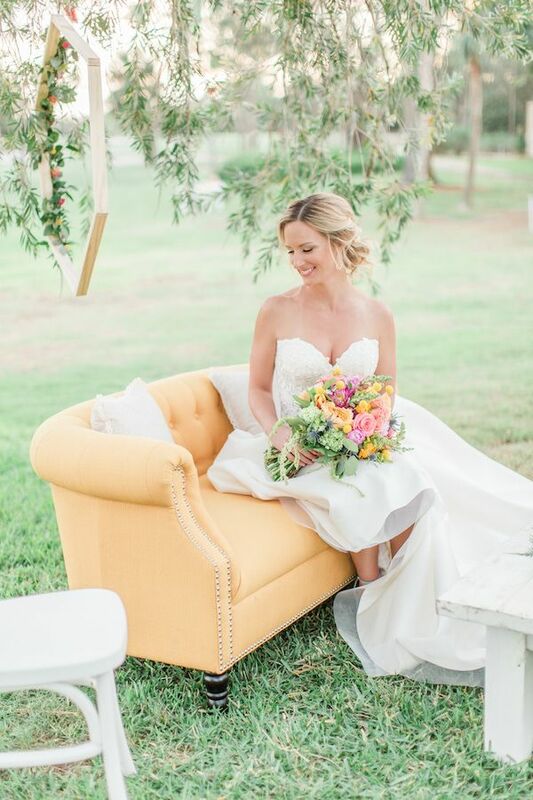 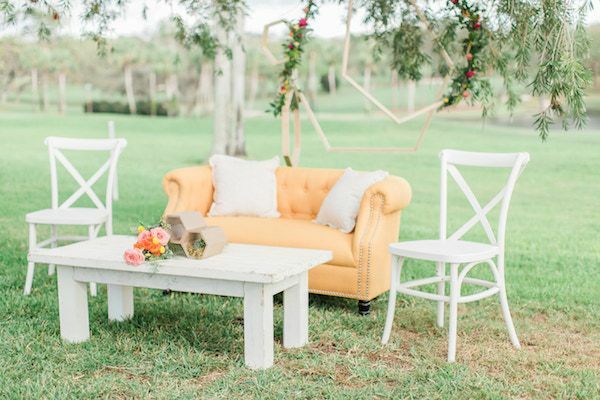 "Probably one of my most favorite pieces of furniture from the whole shoot was the adorable little yellow love seat from A Chair Affair. 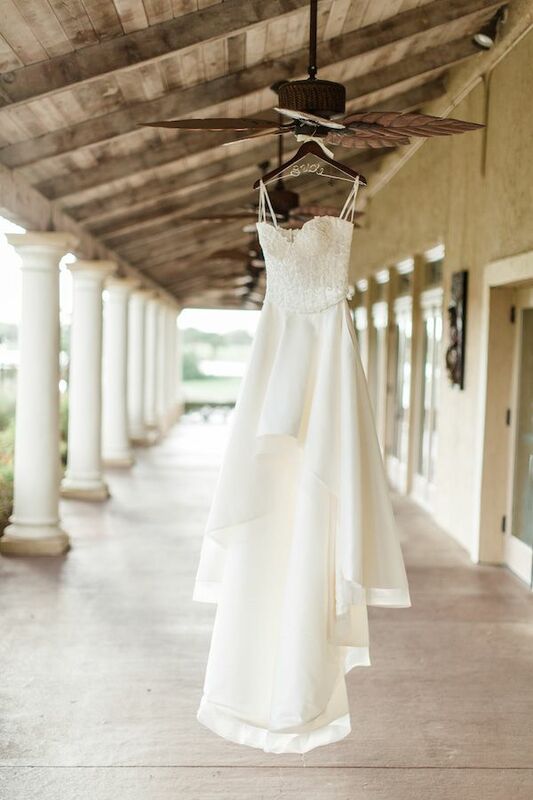 I wanted to take it home with me!" 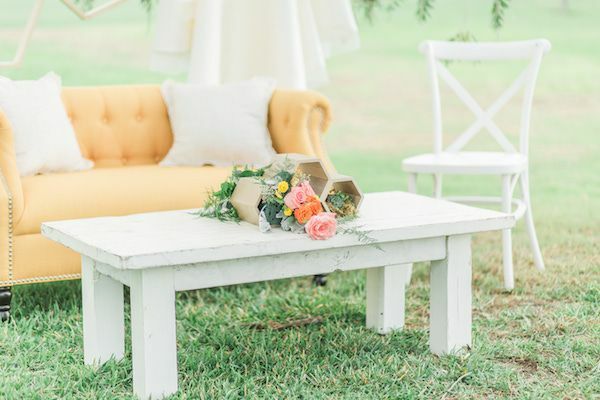 "We paired that piece with two French country chairs and a white farm coffee table, a couple throw pillows and one of the wine rack arrangements." 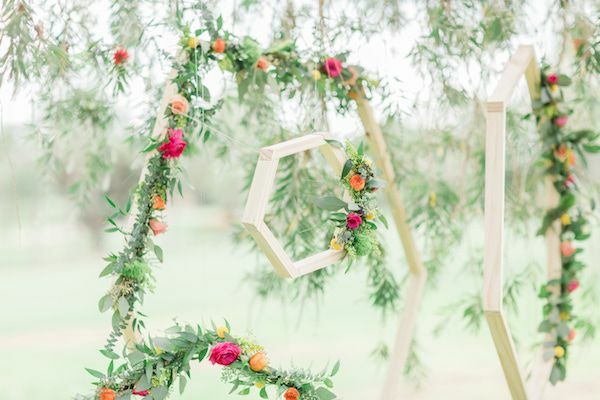 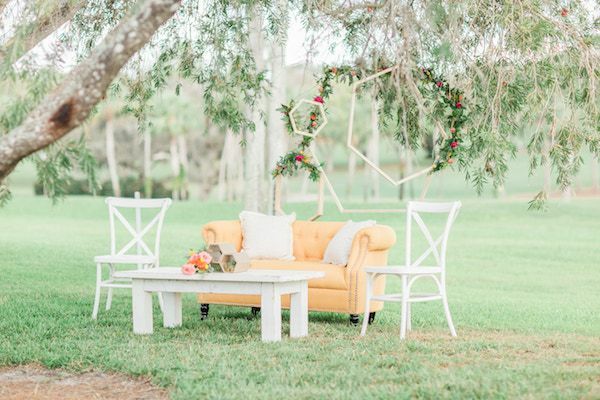 "To complete the look, we hung wooden hexagons adorned with greenery and floral in the trees behind the loveseat and it made for such a romantic little spot for our bride and groom to snuggle up at." 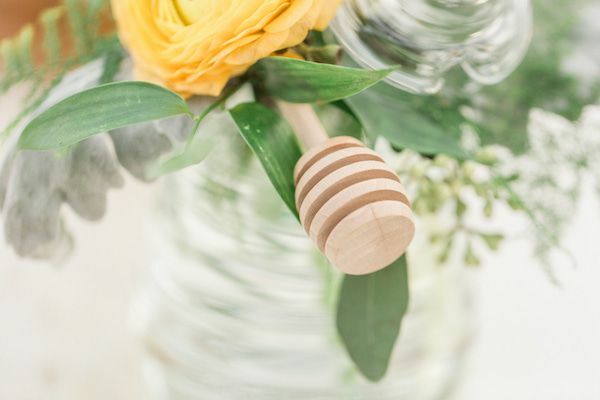 "TwoPeas Designs created a beautiful bee-inspired table number and each setting had a little jar of honey, from my mom's hive of course." 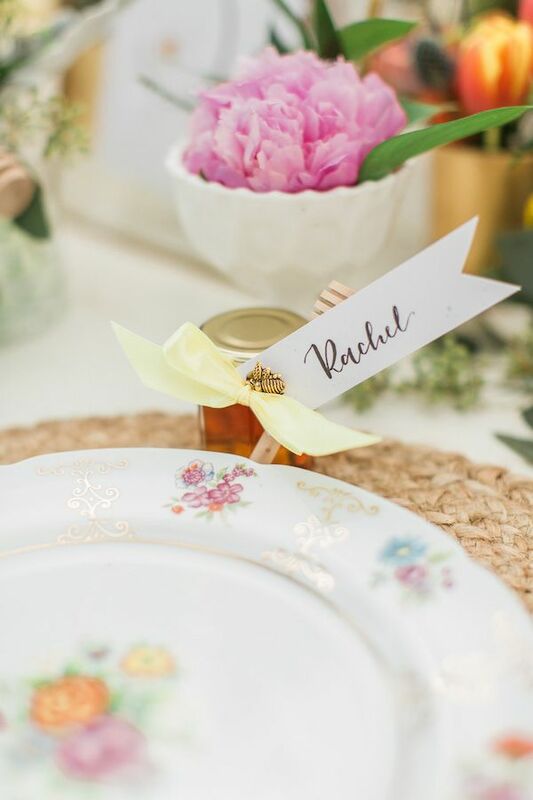 "That little jar also acted as a place card. 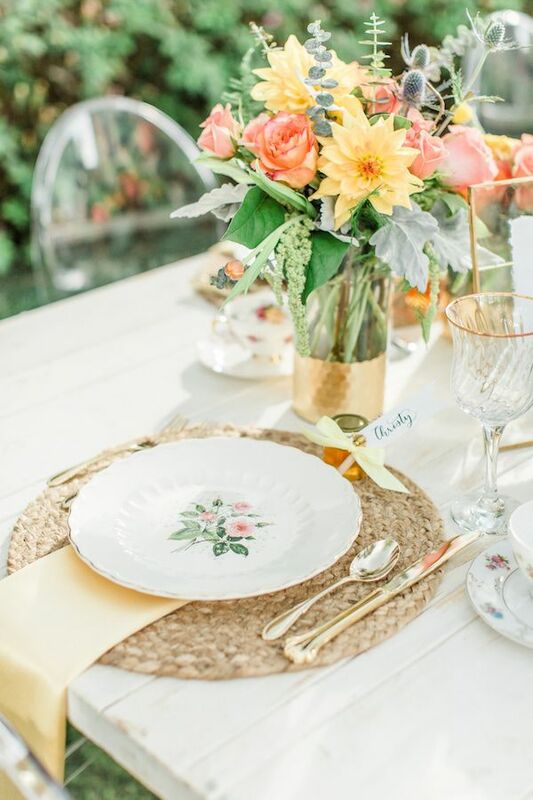 Yellow lamour napkins from Over the Top Rental Linens added another pop of color to the table and tied in so perfectly!" 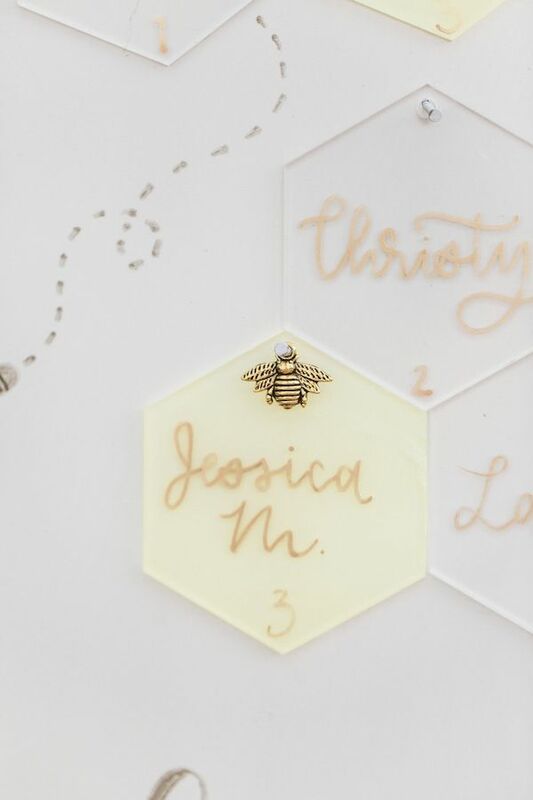 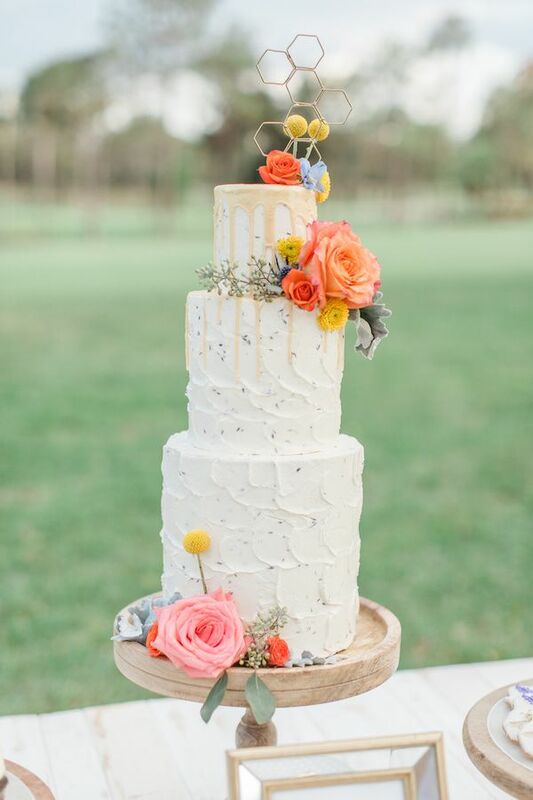 "It even had a hand-made hexagon cake topper! 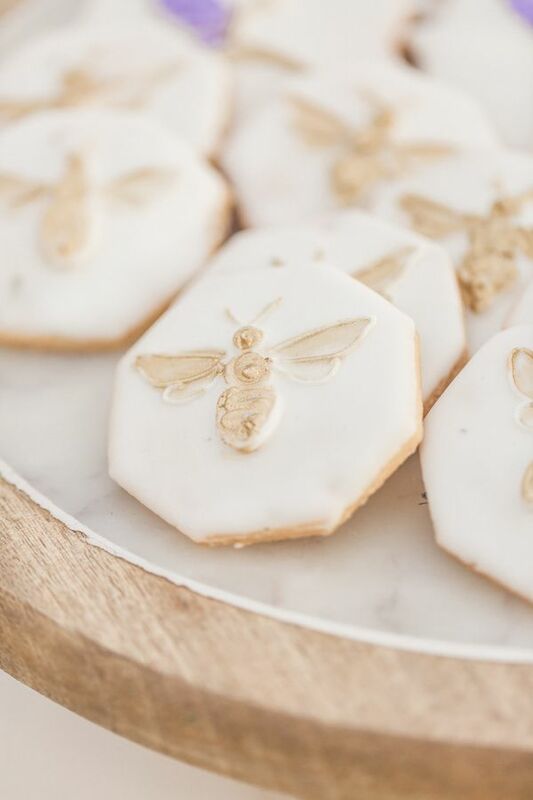 We accented the cake with cupcakes, frosted to look like beehives, hexagon shaped bee cookies, cake pops and macarons with hand painted hexagons on them! 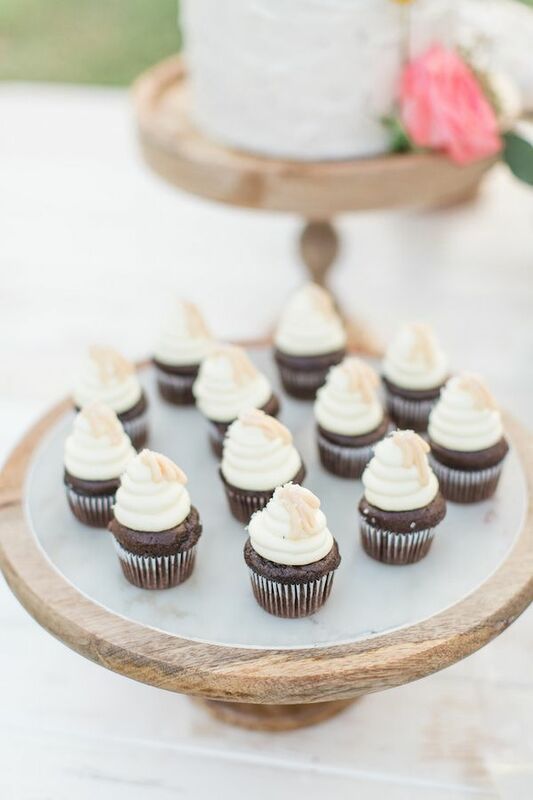 Yum!" 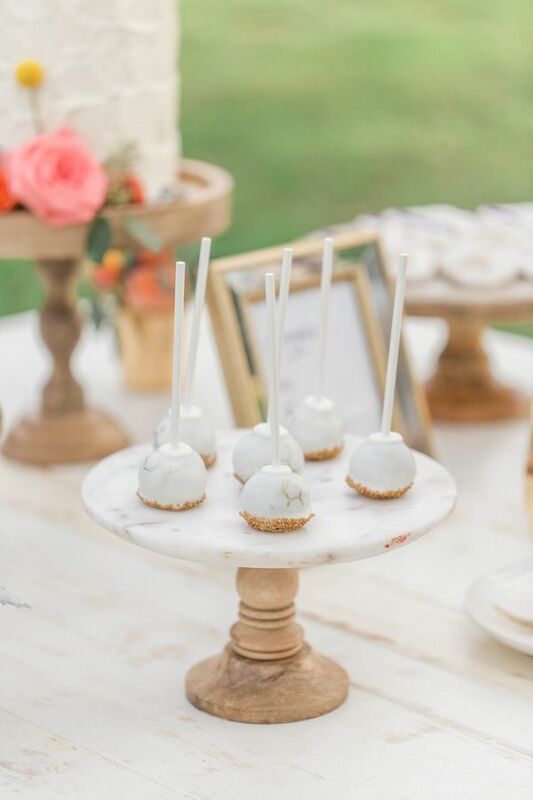 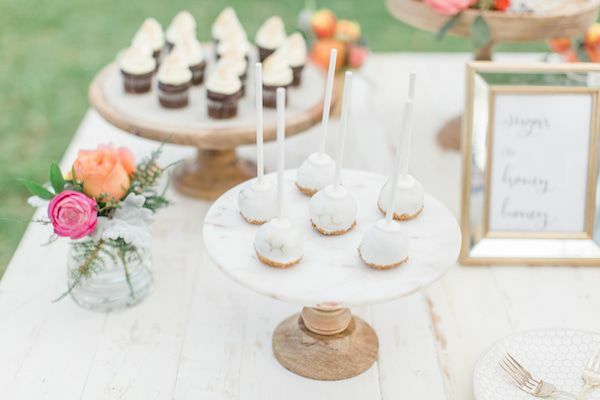 "All of the deliciousness was plated on a white farm table and an adorable sign created by TwoPeas Designs brought a little extra sugar to the table." 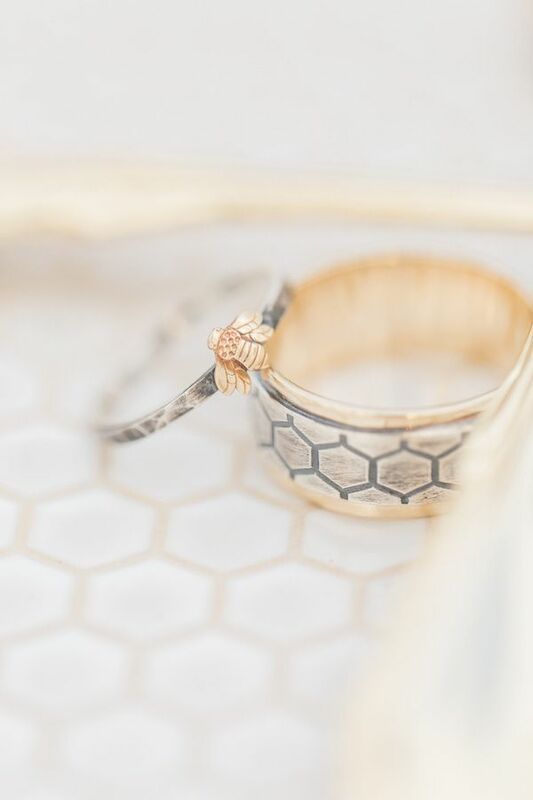 "Now let's talk about some of the smaller details. 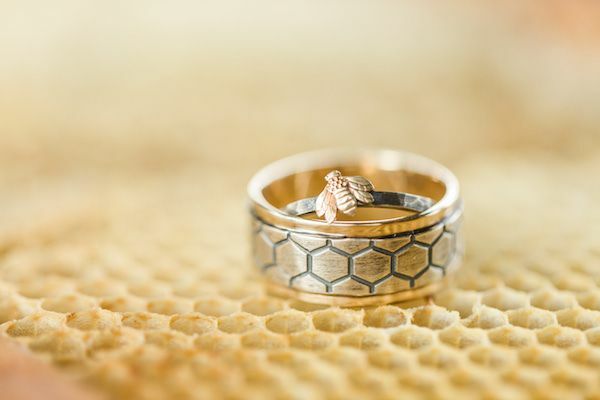 My favorite small detail were the rings! 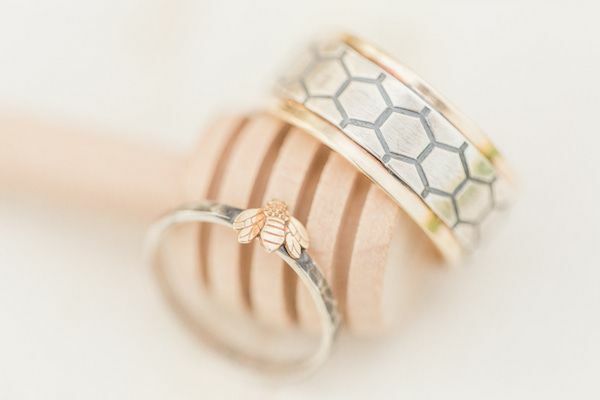 I had found these amazing rings on Pinterest. 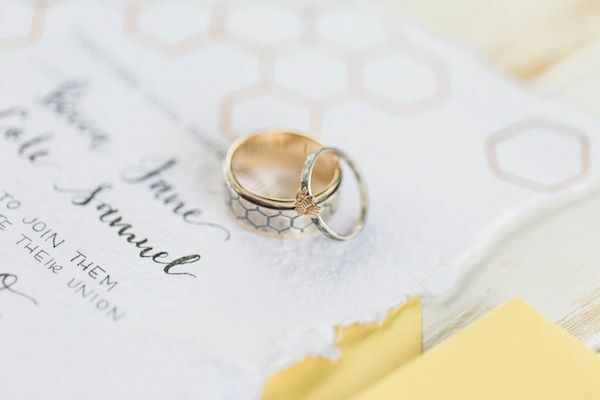 They were bee-inspired and perfect for the shoot!" 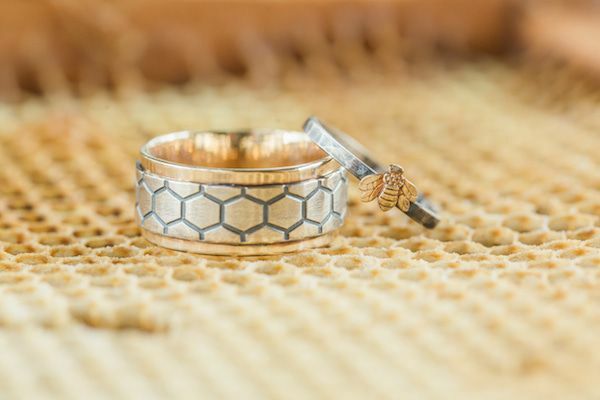 "I was able to find the company that hand makes them and they were generous enough to make a set for us and let us borrow them! 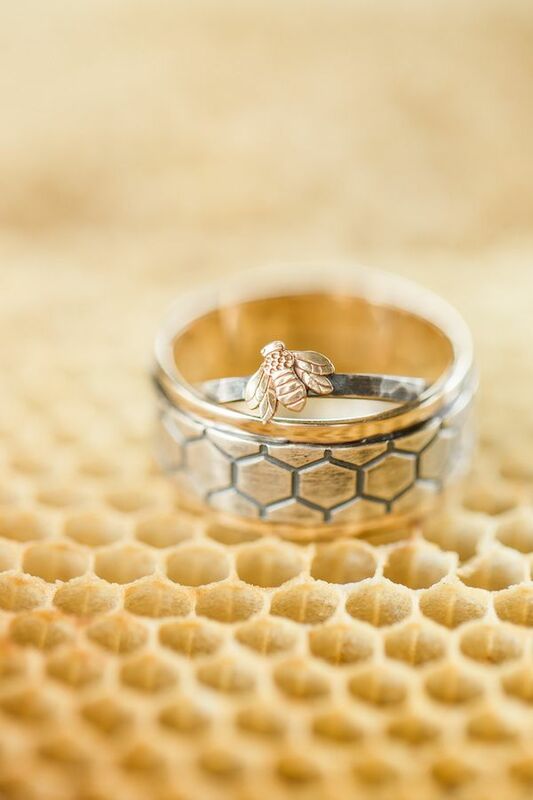 Blazer Arts is amazing and those rings were such a perfect detail for the shoot! 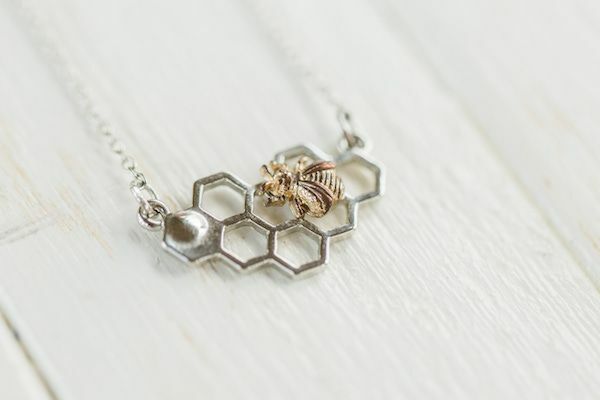 I was able to pick up a few pieces of jewelry and my mom also added to that part by letting us borrow one of her bee necklaces." 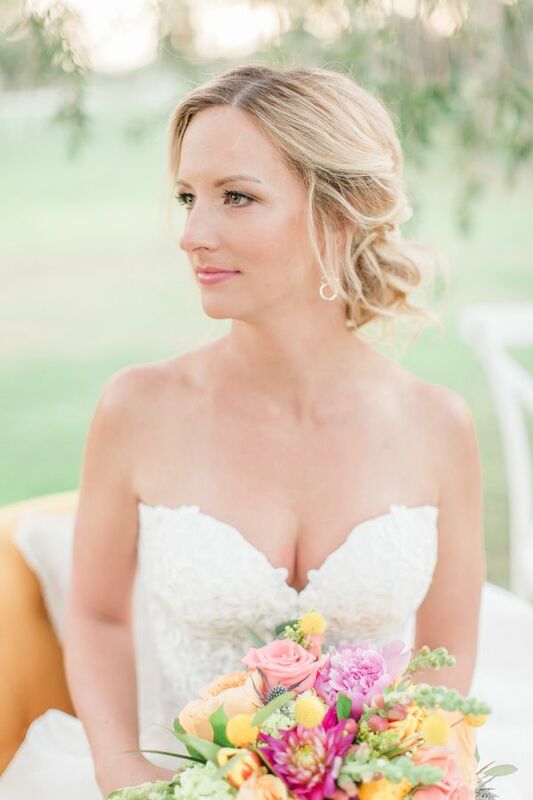 "From day one I wanted a high-low wedding dress and One & Only Bridal delivered just that! 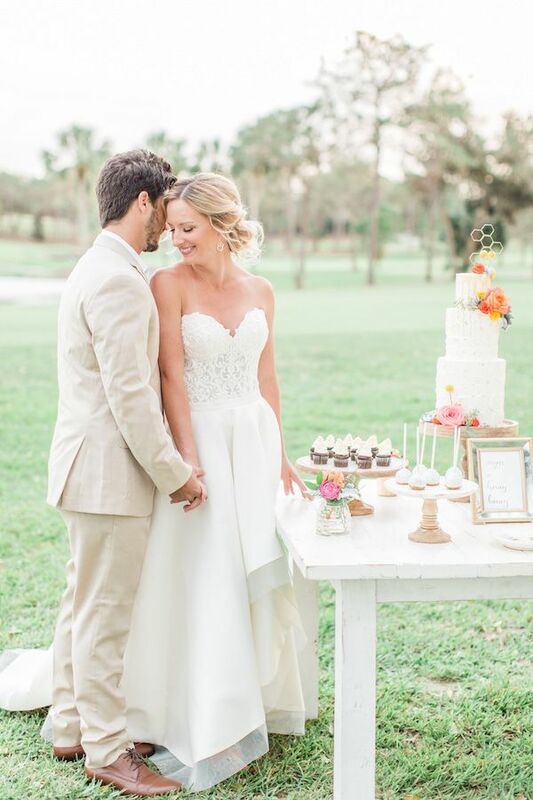 The dress was a two piece with the skirt being simple and elegant, in high-low fashion and the top being sweet and simple with a beautiful lace overlay." 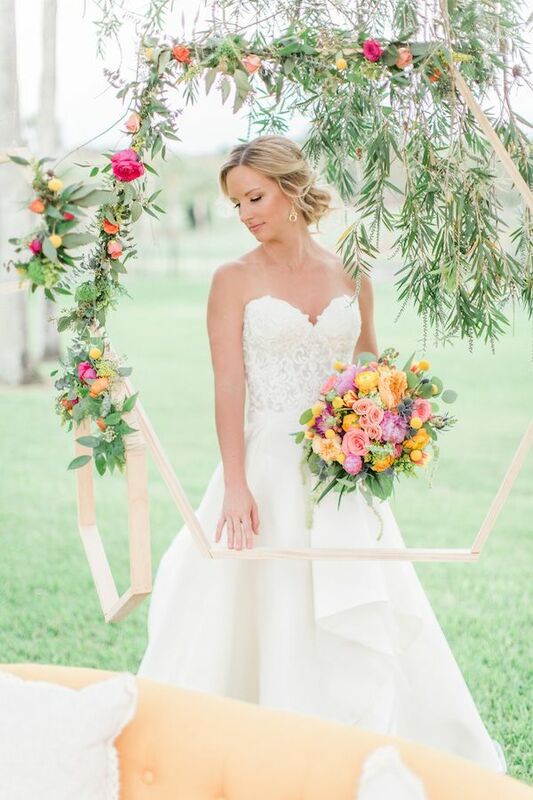 "It was beautiful and it showed off her shoes perfectly. 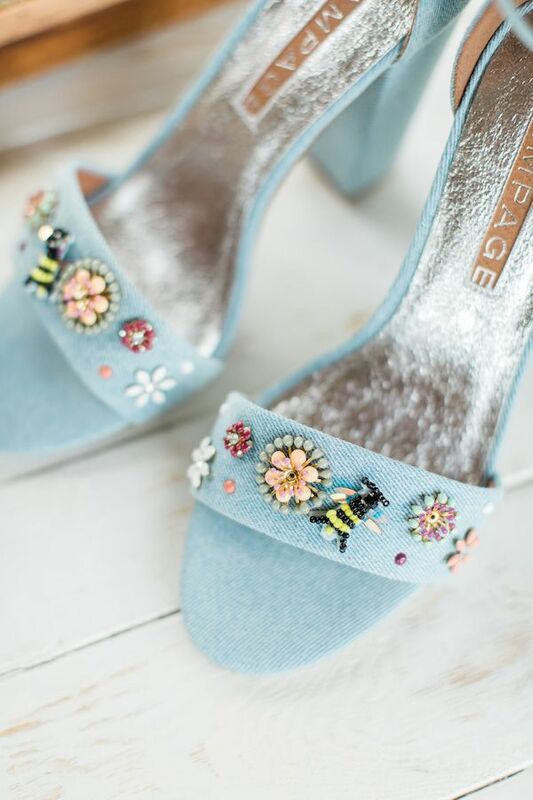 Now about the shoes - I found them at Marshalls and made by Rampage and the moment I saw them I knew I had to have them! 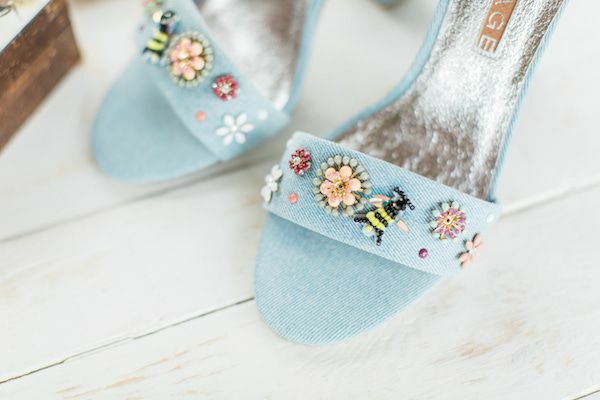 I mean...they had a bee on them! 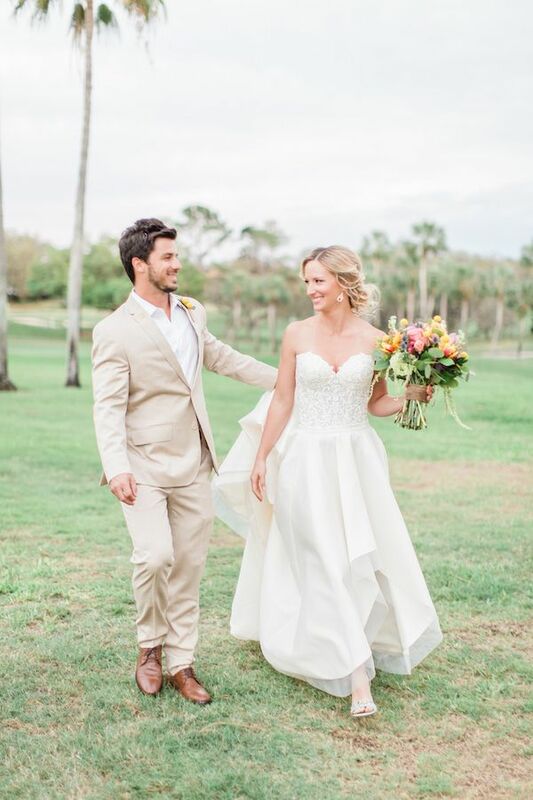 "Her dress went perfectly with his tan suit from The Black Tux. 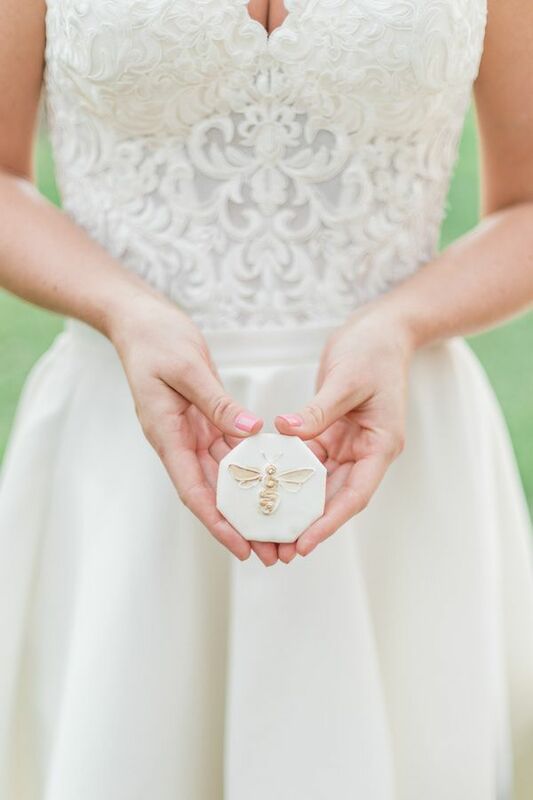 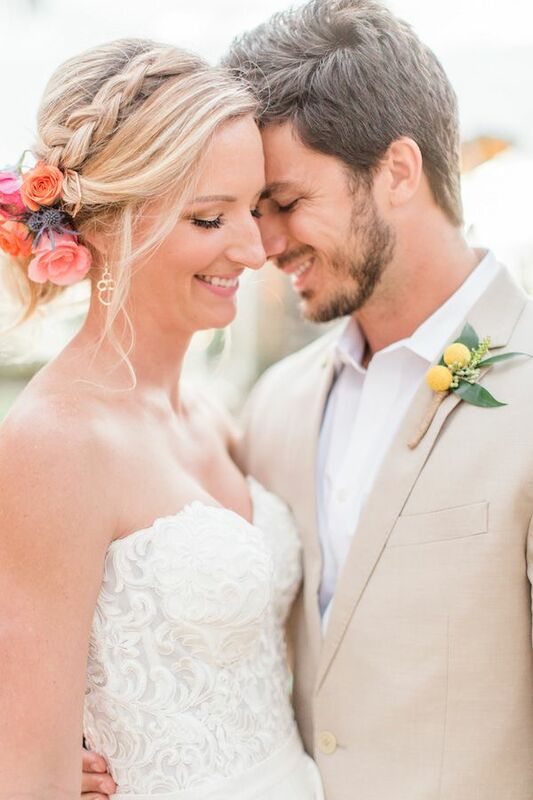 We kept it simple with just a boutonniere and beehive pin, from my mom of course." 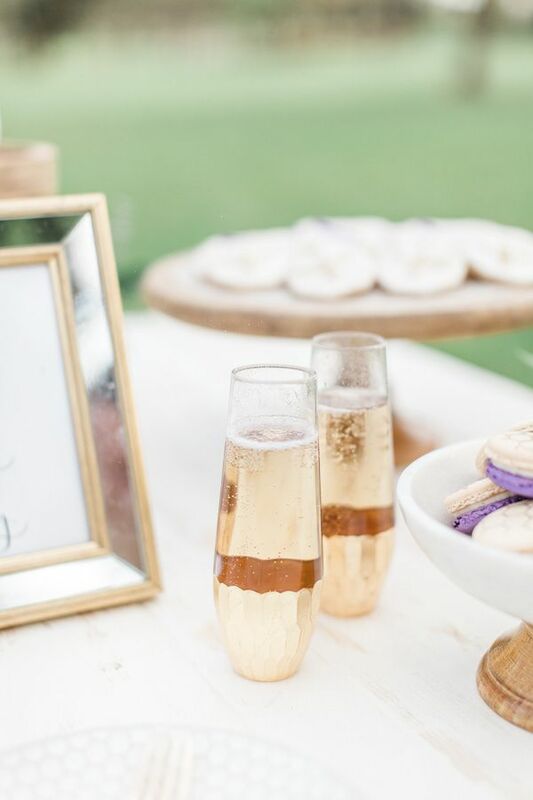 2 Comments " Bold and Buzz-Worthy Wedding Inspo "
preston bailey is a world class, world renowned occasion architect/organizer and has done occasions from presidents and heads of state to the most popular big names and games figures. 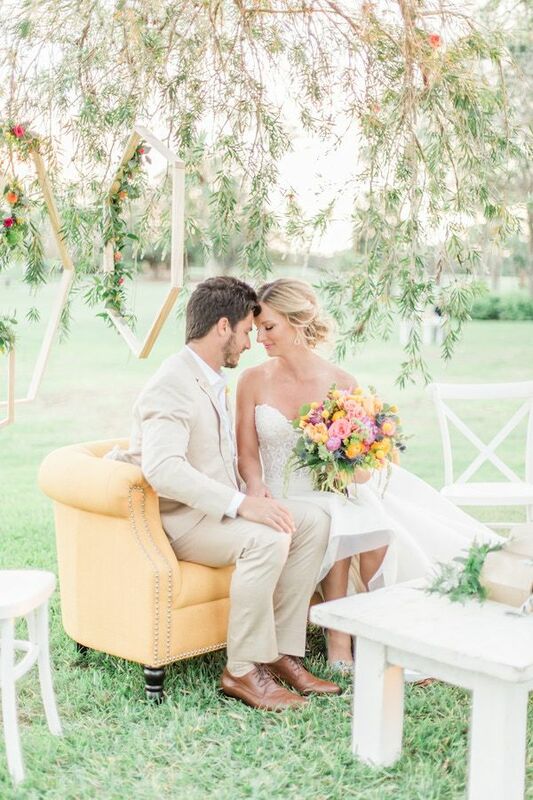 his courses are licensed and he is connected with the wedding organizers relationship of america. 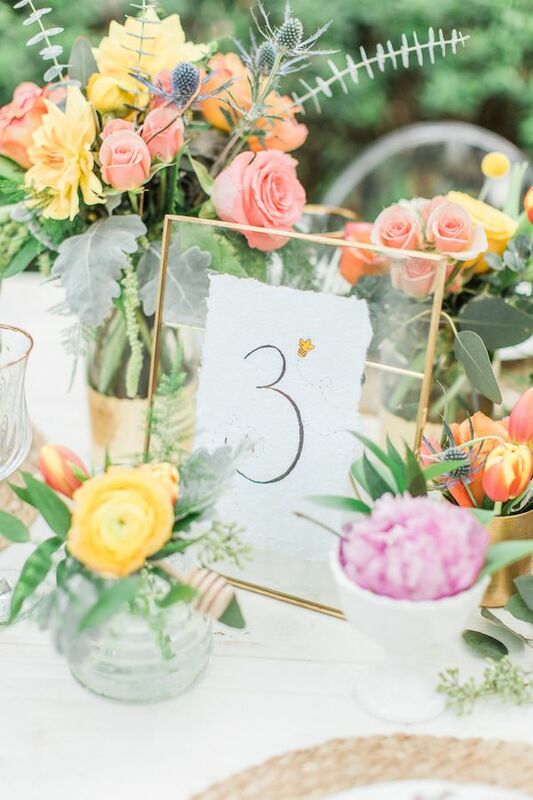 you will be in an ideal situation with his online courses.